5 PASSING SKILLS Passing Technique 1. Gripping the football correctly improves the throwing mechanics and balance of the ball.. To provide enough control and pressure on the surface of the ball, hold the top half with one to three fingers spread across the laces. Practice different grips to find which one works best for you. 2. Turn sideways, toward your throwing shoulder, and point your other shoulder toward the target. 3. Pull throwing arm back to an L position, with football up by the ear. 4. Step toward the target with the front foot as you release the ball. 5. Follow through toward target, with the thumb pointing to the ground and palm facing out. 6. To get the most control, speed, and distance on the ball, throw a spiral. A spiral is also easier for the receiver to catch. Proper release of the football will result in a spiral. The index finger should be the last finger to leave the football. 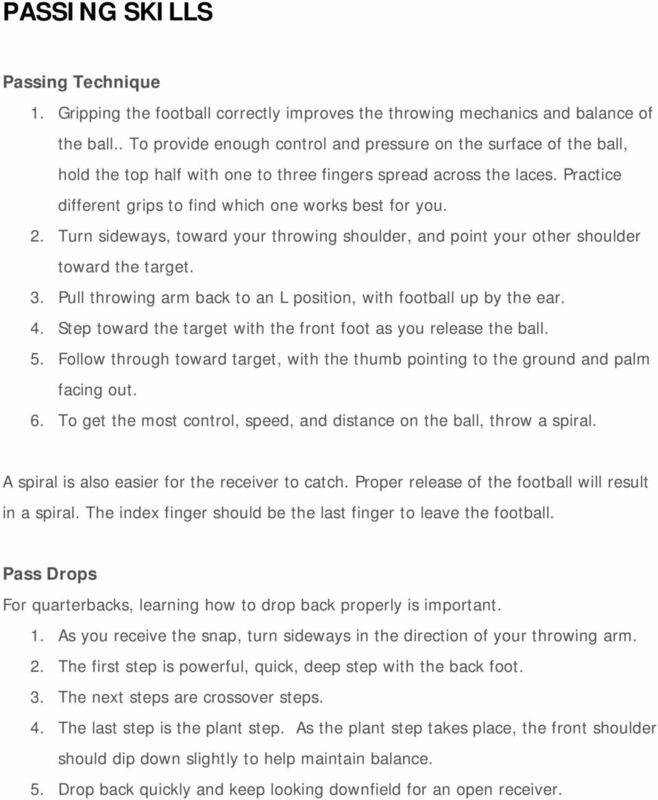 Pass Drops For quarterbacks, learning how to drop back properly is important. 1. As you receive the snap, turn sideways in the direction of your throwing arm. 2. The first step is powerful, quick, deep step with the back foot. 3. The next steps are crossover steps. 4. The last step is the plant step. As the plant step takes place, the front shoulder should dip down slightly to help maintain balance. 5. Drop back quickly and keep looking downfield for an open receiver. 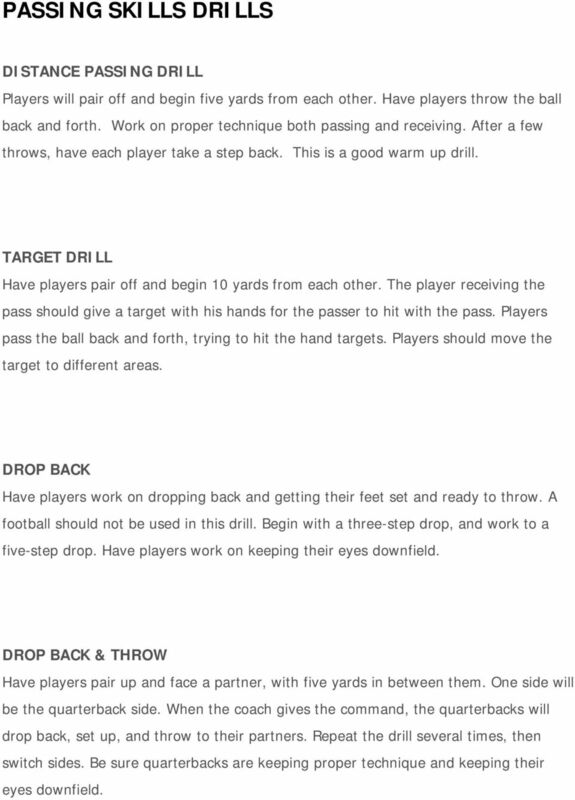 6 PASSING SKILLS DRILLS DISTANCE PASSING DRILL Players will pair off and begin five yards from each other. Have players throw the ball back and forth. Work on proper technique both passing and receiving. After a few throws, have each player take a step back. This is a good warm up drill. TARGET DRILL Have players pair off and begin 10 yards from each other. The player receiving the pass should give a target with his hands for the passer to hit with the pass. Players pass the ball back and forth, trying to hit the hand targets. Players should move the target to different areas. DROP BACK Have players work on dropping back and getting their feet set and ready to throw. 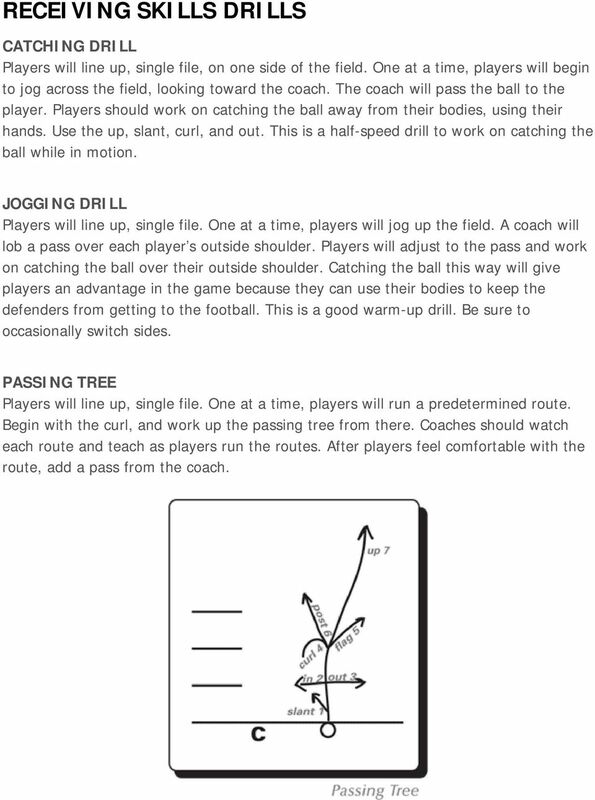 A football should not be used in this drill. Begin with a three-step drop, and work to a five-step drop. Have players work on keeping their eyes downfield. DROP BACK & THROW Have players pair up and face a partner, with five yards in between them. One side will be the quarterback side. 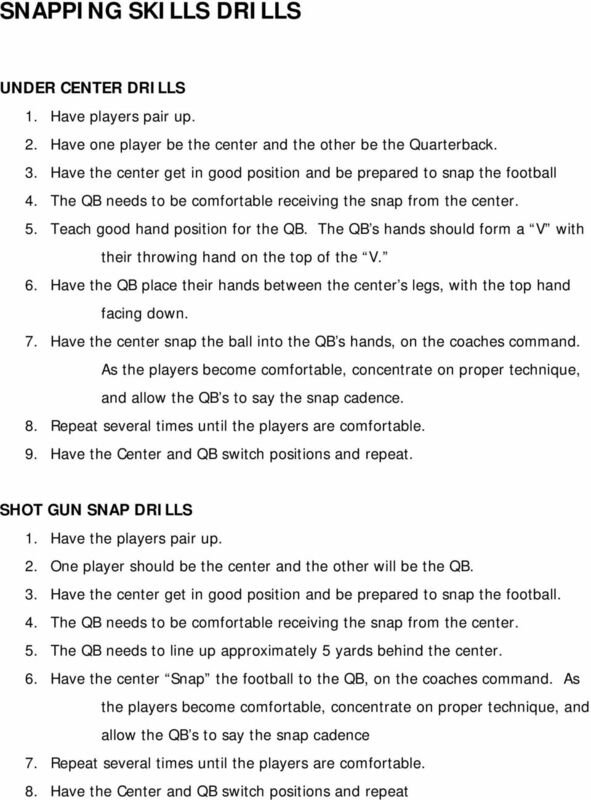 When the coach gives the command, the quarterbacks will drop back, set up, and throw to their partners. Repeat the drill several times, then switch sides. Be sure quarterbacks are keeping proper technique and keeping their eyes downfield. 7 RECEIVING SKILLS CATCHING Most kids have never been taught the correct way to catch a football. We must instruct them on the proper form. 1. Always catch the ball with your hands; away from your body. Elbows should be slightly bent to allow for adjustments as the ball is in flight. 2. For balls above the waist, form a triangle with your index fingers and thumbs. Try to have the point of the football enter the triangle. For balls below your waist, keep the little fingers and elbows together to cradle the catch. 3. Watch the ball all the way into your hands. Keep your eyes open and watch the ball. 4. Once you catch the ball, secure it by quickly tucking it away. Cover the front tip of the football with your fingers. ROUTES A good route has four main parts: start, stem, break, and burst. 1. Start A good route begins with a good stance and start. It s important to gain as much ground as you can as quickly as possible. 2. Stem The receiver forces the defensive back up the field. Run toward the outside shoulder of the defender in an attempt to get him to turn his hips away from the line of scrimmage. 3. Break The receiver transitions from the stem to the burst by making a directionchanging cut. In order to get in and out of a break quickly, stay low and maintain proper balance by keeping your shoulders directly over your feet. 4. Burst The receiver comes out of the break and attempts to create additional separation from the defender. Different routes require different bursts. A curl requires the receiver to come off the break with two steps back to the quarterback and then stop. A post requires a full-speed, continued burst after the break. *Teaching the importance of everyone running his assigned route will be a challenge. This is a good time to explain and teach teamwork. Be patient with players, especially the younger ones. 8 RECEIVING SKILLS DRILLS CATCHING DRILL Players will line up, single file, on one side of the field. One at a time, players will begin to jog across the field, looking toward the coach. The coach will pass the ball to the player. Players should work on catching the ball away from their bodies, using their hands. Use the up, slant, curl, and out. This is a half-speed drill to work on catching the ball while in motion. JOGGING DRILL Players will line up, single file. One at a time, players will jog up the field. A coach will lob a pass over each player s outside shoulder. Players will adjust to the pass and work on catching the ball over their outside shoulder. Catching the ball this way will give players an advantage in the game because they can use their bodies to keep the defenders from getting to the football. This is a good warm-up drill. Be sure to occasionally switch sides. PASSING TREE Players will line up, single file. One at a time, players will run a predetermined route. Begin with the curl, and work up the passing tree from there. Coaches should watch each route and teach as players run the routes. After players feel comfortable with the route, add a pass from the coach. 9 FLAG PULLING Flag pulling is the only way to stop the offense. 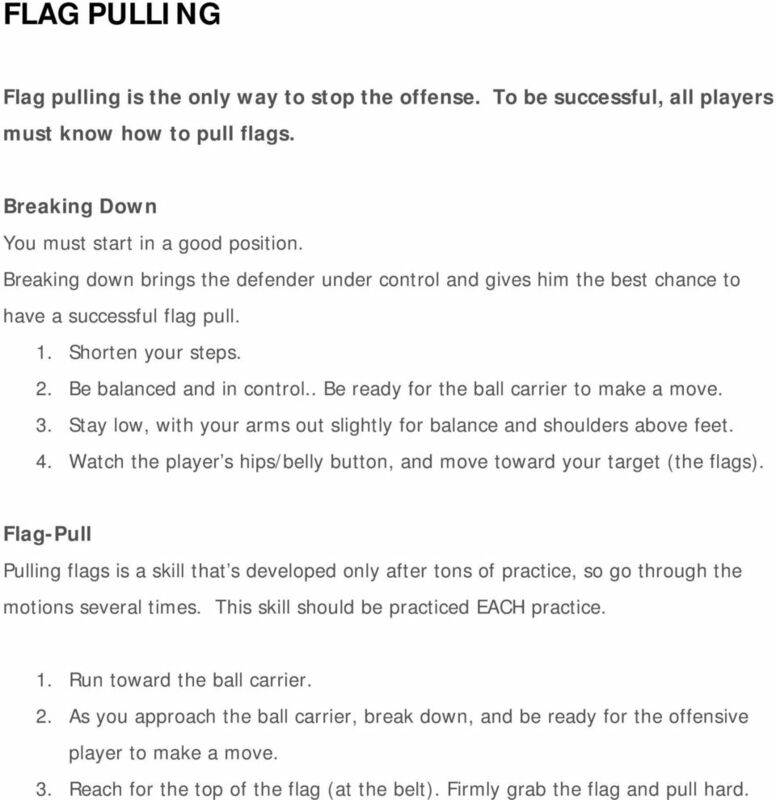 To be successful, all players must know how to pull flags. Breaking Down You must start in a good position. Breaking down brings the defender under control and gives him the best chance to have a successful flag pull. 1. Shorten your steps. 2. Be balanced and in control.. Be ready for the ball carrier to make a move. 3. Stay low, with your arms out slightly for balance and shoulders above feet. 4. Watch the player s hips/belly button, and move toward your target (the flags). Flag-Pull Pulling flags is a skill that s developed only after tons of practice, so go through the motions several times. 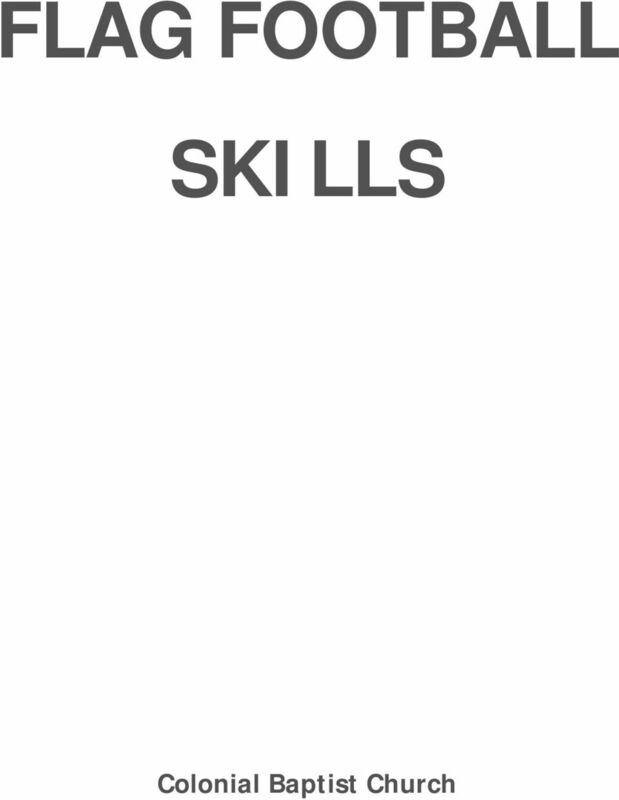 This skill should be practiced EACH practice. 1. Run toward the ball carrier. 2. As you approach the ball carrier, break down, and be ready for the offensive player to make a move. 3. Reach for the top of the flag (at the belt). Firmly grab the flag and pull hard. 10 FLAG PULLING DRILLS BREAK DOWN This can be done with the entire group at once. Have players run half-speed toward you. On the command break down, players should come to a good break-down position using proper technique. ANGLE DRILL Place two cones about five yards apart. Players will form two lines, one offensive and one defensive. One at a time, a ball carrier from the offensive line will run the football through the cones, attempting to juke and run past the defender without getting his flag pulled. The defender will practice taking good angles and trying to pull the flag of the ball carrier. OFFENSE AND DEFENSE Two defenders will line up in a 10-yard alley, with five yards between them. The ball carrier will run through the alley, attempting to get past the defenders, one at a time, until the end line. This will help players develop open-field techniques on both the offensive and defensive sides of the ball. Be sure players rotate and play all positions. 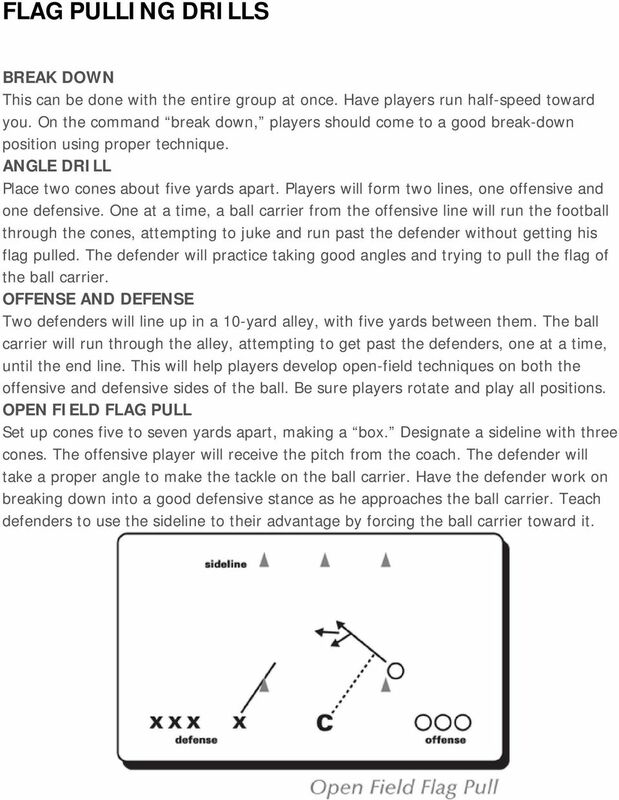 OPEN FIELD FLAG PULL Set up cones five to seven yards apart, making a box. Designate a sideline with three cones. The offensive player will receive the pitch from the coach. The defender will take a proper angle to make the tackle on the ball carrier. Have the defender work on breaking down into a good defensive stance as he approaches the ball carrier. Teach defenders to use the sideline to their advantage by forcing the ball carrier toward it. 11 BACKPEDALING BACKPEDALING BASICS In order to play effective defense, all players must learn how to backpedal. A backpedal is necessary to keep a defender in a position where he can make a play on the receiver while maintaining a cushion so he doesn t get beaten on a deep pass. 1. Begin in a good defensive stance (knees bent, back straight, head and shoulders over feet). 2. Push off of the front foot, and step with the back foot. 3. Shoulders should be parallel to the line of scrimmage. 4. When the receiver gets within three yards, the defensive back turns to run with the receiver. BACKPEDALING DRILLS All players will need to work on this move, and repetition is the best way to become comfortable with backpedaling. 1. Have players line up across a line. 2. On the coach s command, players will backpedal 10 yards, focusing on proper form. 3. Start slow, then encourage players to speed up as they become comfortable with backpedaling. The goal is to backpedal as fast as a receiver runs forward. 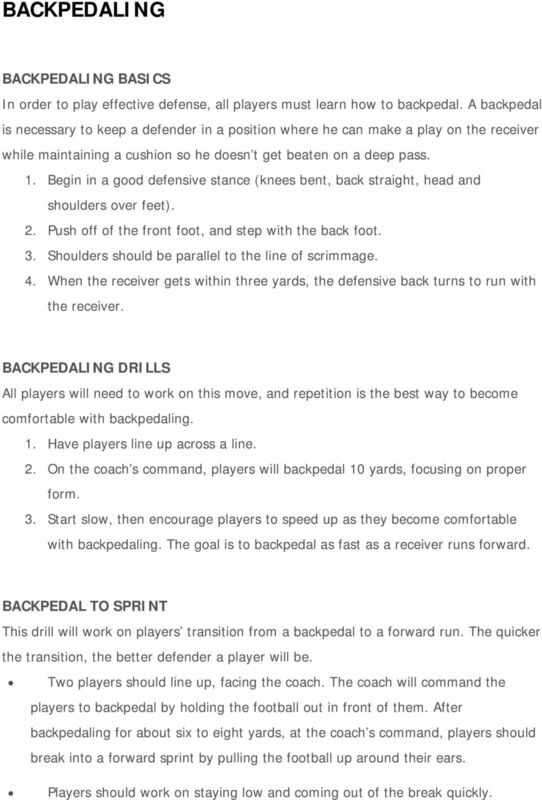 BACKPEDAL TO SPRINT This drill will work on players transition from a backpedal to a forward run. The quicker the transition, the better defender a player will be. Two players should line up, facing the coach. The coach will command the players to backpedal by holding the football out in front of them. After backpedaling for about six to eight yards, at the coach s command, players should break into a forward sprint by pulling the football up around their ears. Players should work on staying low and coming out of the break quickly. 12 BACKPEDAL & REACT Players will backpedal and react to the pass. 1. One player will begin, facing the coach, about five yards out in front of the coach. The coach will give the backpedal command by pulling the football up toward his chest. After the player backpedals for about five to six yards, the coach will turn 45 degrees to the left or right. The player should react by making a 45-degree break in that direction. 2. After the player breaks, the coach will throw the ball in the defender s direction. 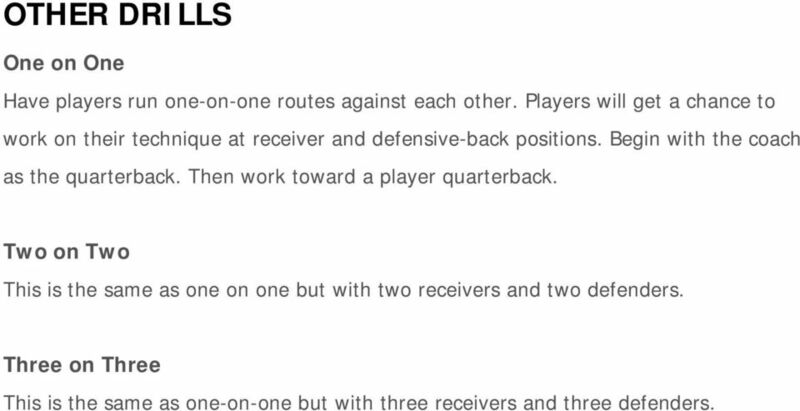 13 OTHER DRILLS One on One Have players run one-on-one routes against each other. Players will get a chance to work on their technique at receiver and defensive-back positions. Begin with the coach as the quarterback. Then work toward a player quarterback. Two on Two This is the same as one on one but with two receivers and two defenders. Three on Three This is the same as one-on-one but with three receivers and three defenders. Copyright 2014 l l All Rights Reserved. Bat Selection The starting point for any hitter is finding the right bat size. Have the player grip the bat at the end of the handle and lift it with one arm, fully extended, straight out from their body. 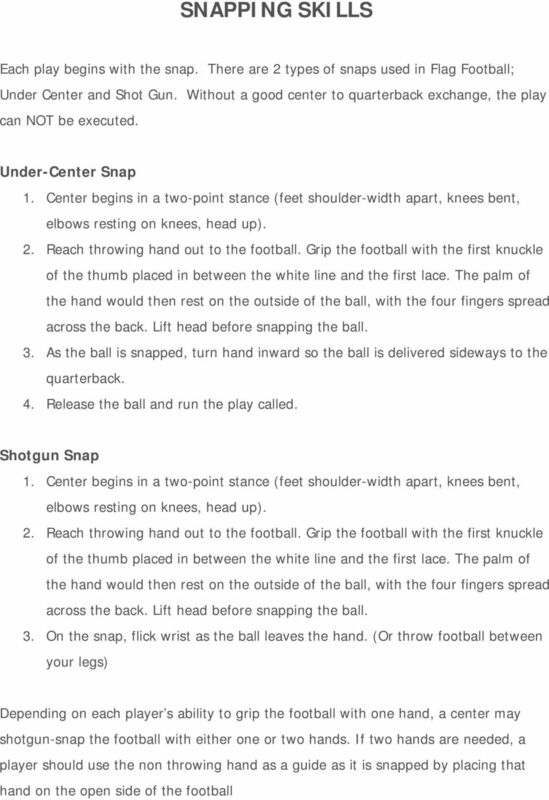 The 4-4 Defense Photo copy and create Play sheets Introduction to Defense When young kids decide to play football it is likely that the glory of scoring offensive touchdowns is what draws them to the game. 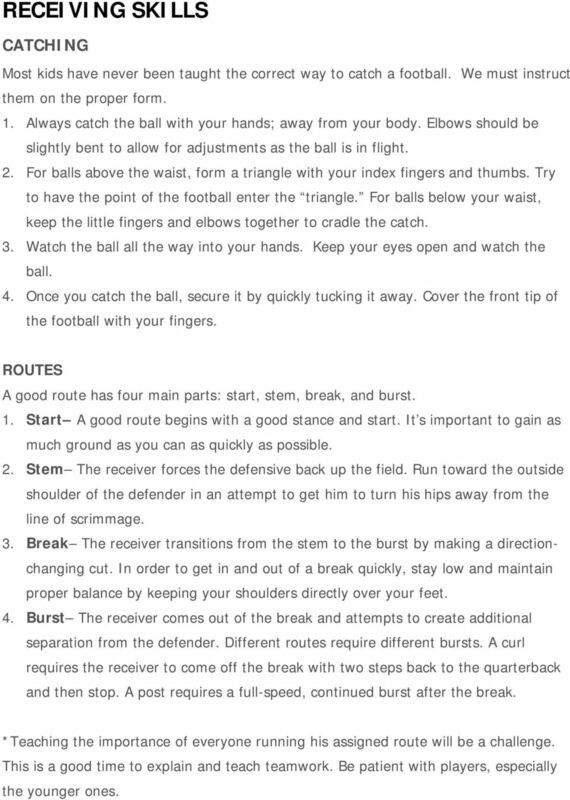 KWAA Cardinals Flag Football 2007 Playbook. Ultimate Frisbee conditioning plan There are many reasons to train for any sport. You can increase your endurance, your speed, your jumping ability, etc. Training is also very important in reducing injuries. 27 Soccer Specific Conditioning Drills Free Email Newsletter at worldclasscoaching.com 27 Soccer Specific Conditioning Drills Technical and tactical sessions all with a conditioning element using a ball. Ball Control Drills and Games Select from a large variety of Ball Control drills and games to custom design your own practice sessions. There are fun and challenging practices for every age and skill level. It Features: Fewer numbers of players. A smaller court area. A smaller and softer ball. A lower net. Rolling substitutes. NPD COACHING MANUAL. Kindergarten, First, and Second Grades. Prepared by: For the exclusive use of the Naperville Park District coaching staff. July - August, 2010 6 Week Program Agility and Quickness Program This portion of the program should be completed at least once a week. That only asks 6 total sessions of you until training camp begins. Hurdle Training. Manual. Drills and exercises to help you get the most out of your Hurdle training program!